This study applies the theory of planned behavior (TPB), a theory that is commonly used in commercial settings, to the educational context to explain pre-service teachers’ technology acceptance. It is also interested in examining its validity when used for this purpose. It has found evidence that the TPB is a valid model to explain pre-service teachers’ acceptance of technology, specifically in terms of their behavioral intention to use technology. Two hundred and ninety-three participants completed a questionnaire measuring their responses to four constructs from the TPB, namely behavioral intention, attitudes towards computer use, subjective norm and perceived behavioral control. Structural equation modeling (SEM) was used as the main method for data analysis. The results showed that attitude towards computer use had the largest effect on pre-service teachers’ intention to use technology, followed by perceived behavioral control, and subjective norm. The findings presented in this paper purport to contribute to the growing interest in using information sciences models to explain technology acceptance in the educational context. Teo, T. & Tan, L. (2012). The theory of planned behavior (TPB) and pre-service teachers’ technology acceptance: A validation study using structural equation modeling. 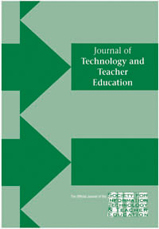 Journal of Technology and Teacher Education, 20 (1), 89-104. Waynesville, NC USA: Society for Information Technology & Teacher Education. Retrieved April 20, 2019 from https://www.learntechlib.org/primary/p/36090/. Abbott, J., & Faris, S. (2001). Integrating technology into preservice literacy instruction: a survey of elementary education students’ attitudes toward computers. Journal of Research on Computing in Education, 33(2), 149-161. Cheung, W., & Huang, W. (2005). Proposing a framework to assess internet usage in university education: an empirical investigation from a student’s perspective. British Journal of Educational Technology, 36(2), 237-253. Crowe, A. R. (2004). Teaching by example: integrating technology into social studies education courses. Journal of Computing in Teacher Education 20(4), 159-165. Fishbein, M., & Ajzen, I. (1975). Belief, attitude, intension and behavior: An introduction to theory and research. Reading, ma: addison Wesley. Fornell, C., & Larcker, D. F. (1981). Evaluating structural equation models with unobservable variables and measurement error. Journal of Marketing Research, 48, 39-50. George, J. F. (2004). The theory of planned behavior and internet purchasing. Internet Research, 14(3), 198-212. Hair, J. F., Black, B., Babin, B., & Anderson, R. E. (2010). Multivariate data analysis: A global perspective (6th ed.). Upper Saddle River, nJ: Prenticehall international. Huang, H. M., & Liaw, S. S. (2005). Exploring user’s attitudes and intentions toward the web as a survey tool. Computers in Human Behavior, 21(5), 729743. Klem, L. (2000). Structural equation modeling. In Grimm, L. And yarnold, P. Reading and understanding multivariate statistics, Vol. Ii. Washington, dC: american Psychological association. Kline, R. B. (2005). Principles and practice of structural equation modeling (2nd ed.). New york, ny: Guilford Press. Marcinkiewicz, H. R., & Regstad, N. G. (1996). Using subjective norms to predict teachers’ computer use. Journal of Computing in Teacher Education, 13(1), 27–33. Mathieson, K. (1991). Predicting user intentions: Comparing the technology acceptance model with the theory of planned behavior. Information Systems Research, 2, 173-191. Mcdonald, R. P., & Ho, M. R. (2002). Principles and practice in reporting structural equation analyses. Psychological Methods, 7(1), 64-82. Pelgrum, W. J. (2001). Obstacles to the integration of iCT in education: Results from a worldwide educational assessment. Computers & Education, 37, 163–178. Shapka, J.D., & Ferrari, M. (2003). Computer-related attitudes and actions of teacher candidates. Computers in Human Behavior, 19(3), 319–334. Shiue, Y. M. (2007). Investigating the sources of teachers’ instructional technology use through the decomposed Theory of planned behavior. Journal of Educational Computing Research, 36(4), 425-453. Smarkola, C. (2008). Efficacy of a planned behavior model: Beliefs that contribute to computer usage intentions of student teachers and experienced teachers. Computers in Human Behavior, 24(30), 1196-1215. Spiller, J., Vlasic, A., & Yetton, P. (2007). Post-adoption behavior of users of internet service providers. Information and Management, 44, 513-523. Sugar, W., Crawley, F., & Fine, B. (2004). Examining teachers’ decisions to adopt new technology. Educational Technology and Society, 7(4), 201-213. Teo, T. (2007). Perceived importance, enjoyment, and anxiety as correlates of computer attitudes. Psychological Reports, 100(1), 127-135. Teo, T. (2009). Modeling technology acceptance in education: a study of preservice teachers. Computers & Education, 52(1), 302-312. Teo, T., Lee, C. B., & Chai, C. S. (2008). Understanding pre-service teachers’ computer attitudes: applying and extending the Technology acceptance model (Tam). Journal of Computer Assisted Learning, 24(2), 128-143. Teo, T., & Van Schaik, P. (2009). Understanding technology acceptance among pre-service teachers: a structural-equation modeling approach. The AsiaPacific Education Researcher, 18(1), 47-66. Zhao, Y., & Cziko, G.A. (2001). Teacher adoption of technology: a perceptual control theory perspective. Journal of Technology and Teacher Education, 9(1), 5-30.